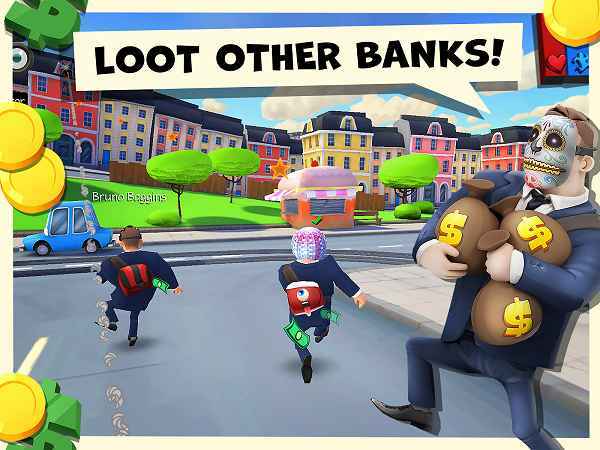 Do you want to loot some cash from the banker? or you want to stop thieves from stealing money? 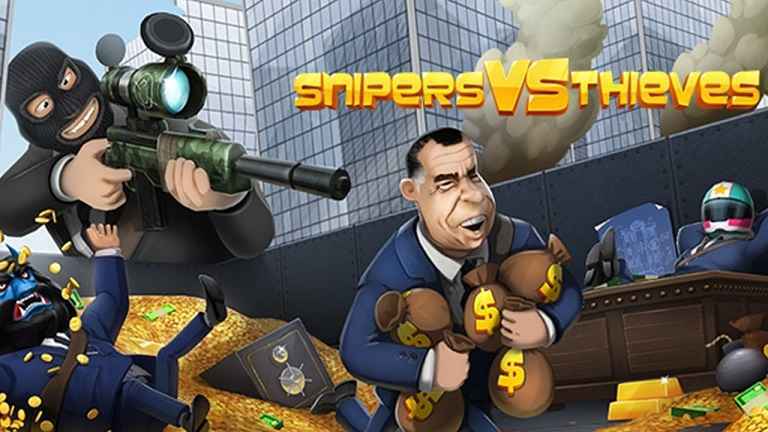 you can do both in this mobile online multiplayer game called Snipers vs Thieves MOD APK.The amount of variations and unique Multiplayer gameplay,this is what makes this game a unique and addictive from all other games. Its a highly addictive fast paced heist game. 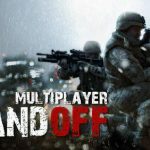 You can play with friends or player around the world its all up to you. Play as one of the 4 thieves and try flying with all cash or shoot those 4 thieves down to protect the money. 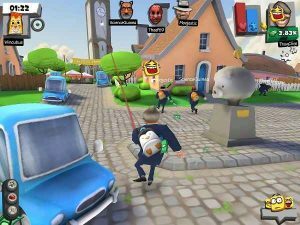 Being sniper you will have to take down thieves from reaching to their van. if they does you will be failed in your task.and if you are playing as thieves you will have to reach the van with all the money at any cost. Being Thieves is much more fun than being a sniper. 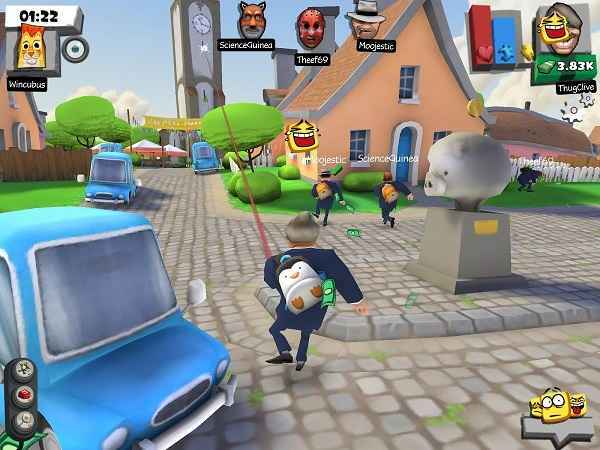 you will be playing with other 3 players,in total of 4 thieves in a single match. 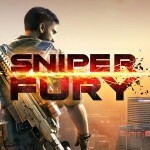 you will have objects to hide from the sniper. you will be using Cars,trees,barrels and boxes to hide.Its almost feels like playing any stealth game. 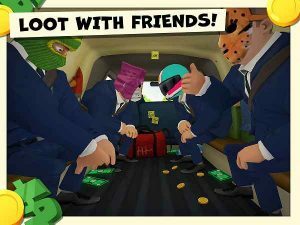 If any member in the thief gang dies then you will have opportunity to collect their loot and reach the van.In the end of the round if thieves win the round their looted money will be divided in them. Difficulty is not the problem here because its all about being a skilled player. Its a game of skills,player with higher skills will get to the van easily. only way to improve your skills is by playing the game. 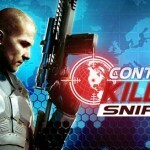 On Main page you will be able to pick any side freely.you want to be Sniper or thief its all up to you. In snipers store you will be able to put up some mask and giving player accuracy and better view angles.If developers put more fun stuffs in the game then player will less likely to leave this game. 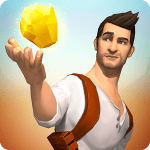 Its still fun and addictive game. 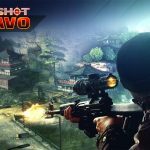 Fast matchmaking and unique gameplay this is what makes Snipers vs Thieves MOD APK stands in all other top notch Multiplayer games. Same issue unable to collect briefcase. Every full shows full. mod not working perfectly. cannot collect briefcases. 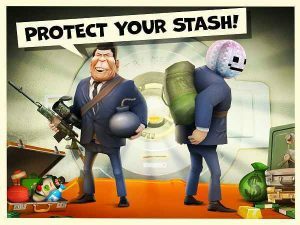 Do you get any suitcases from games ? Please update!!! What about previous dates??? Total waste of time ugh? Do we have to start all over again??? That su kisses man!! Is it possible to turn off auto-fire and laser? I think it would be much more fun with just accuracy, no reload and recoil. Not to mention less conspicuous. Hi RG!! Fyki, the mod works just fine! Over-writing over previous original apk didn’t work out for me. as it fails to add the REWARD MONEY AND STARS GAINED!! Please add GOLD MOD & CASH MOD too. or Just have that MOD only! Hi RG. Long time since I last commented on ur work. Anyway, I have installed and been playing the original version. Will this MOD work if I replace on the existing game? RG, you have made so many great mods including the one ive been playing for the past 4 months LDOE, but can you update this please???? 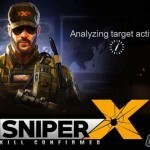 Heey RG I’m very impressed with this mod hey it’s working great but like Johan said, we do not get the rewards for sniper mode… no cash no ranked rewards.. so the only way to get a lot of cash is to play as a thief and being a sniper is just for the fun of it. i really appreciate this mod and your effort RG but would there be a possibility to fix it ?? as we would like the rewards to the sniper mode.